This book tells the story of a catastrophe caused by exploitation and depletion, need and greed. Ultimately, a story of restoration and rebirth spawned by a people’s dedication to restore Montana’s wildlife. Passage of protective laws during the latter years of the 19th century and early 20th century, coupled with gradually increasing efforts to enforce those laws, accounts for a portion of Montana’s wildlife restoration. However, most of the restoration success came from hunters, ranchers, farmers, government agencies and universities all cooperating in a wide-ranging wildlife restoration effort to trap and transplant wildlife. This effort spread across the state with a single goal in mind – replenishing what had been lost during the 1800s and early 1900s. 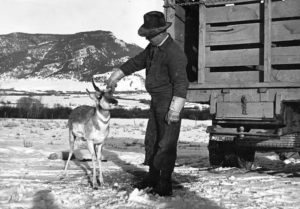 Restoration of Montana’s wildlife resource was an epic effort extending through 6 generations, 5 wars, an economic collapse and the greatest North American climate disaster of the 20th century. 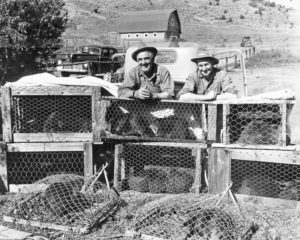 By the end of this century, wildlife was more abundant in Montana than any time during the previous 130 years. Most of this story is largely untold and is the subject of this book. Over a decade ago a small group of wildlife biologists formed an ad hoc committee which began serious discussions about the need to document and pay tribute to the many people who sacrificed and were passionate about restoring Montana’s wildlife. 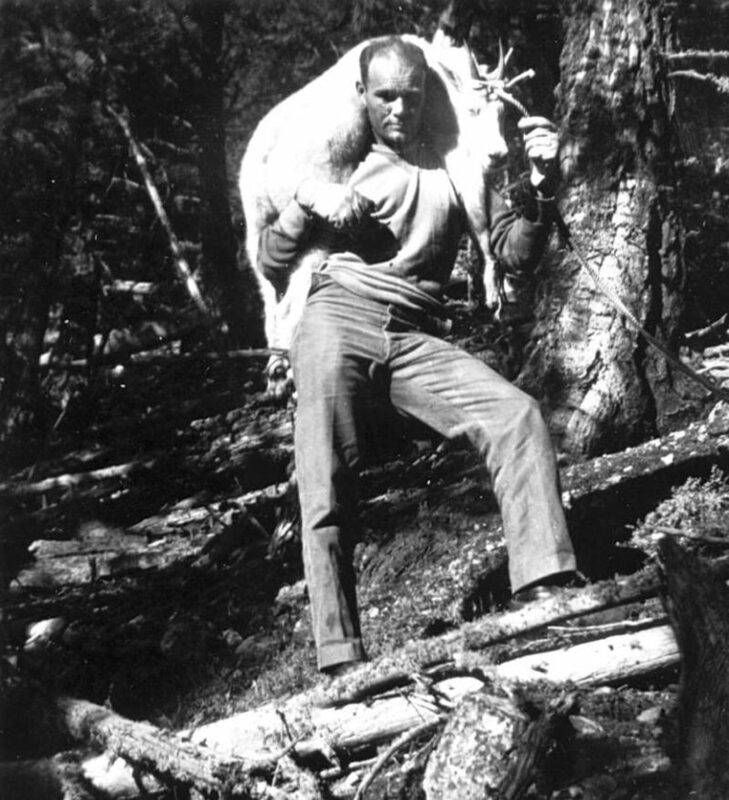 Harold D. Picton, a Montana Fish and Game wildlife biologist in the late 1950s-early 1960s and professor emeritus of Fish and Wildlife management at Montana State University in Bozeman, was contacted and agreed to help lead the way with this ambitious wildlife legacy project by writing a book. His research started in 1999 and involved videotaping discussions with dozens of people who had made a career of wildlife restoration and conservation in Montana. 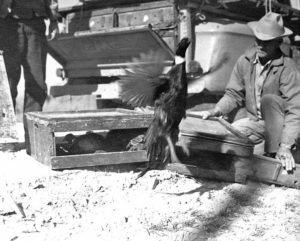 Most of the people interviewed were wildlife pioneers in the 1940s and 1950s and are responsible for many of the abundant wildlife species and populations we have today. 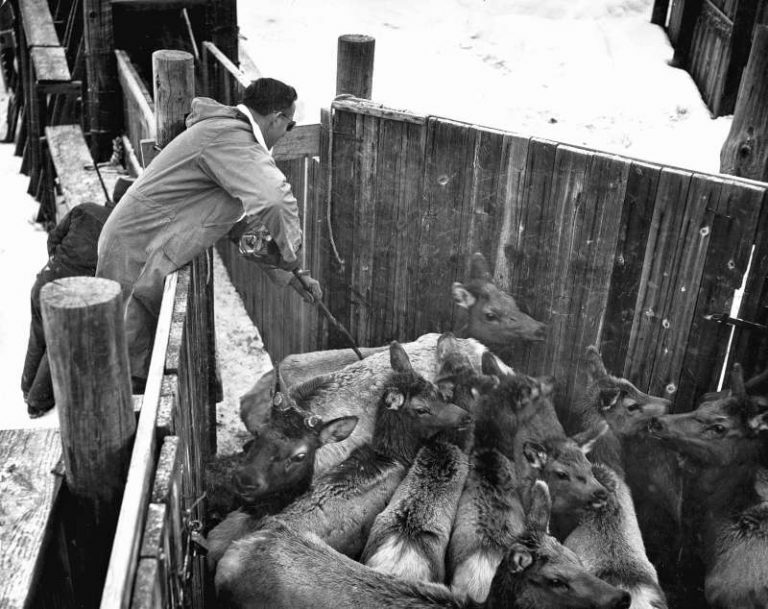 This oral history of Montana’s wildlife legacy would probably have been lost if these discussions were not videotaped, transcribed and archived. Several people videotaped have since gone to the “Happy Hunting Ground”. Additionally, thousands of hours were spent reading, researching and discovering documents and historic photos filed away in obscure or hard to find places and private collections. 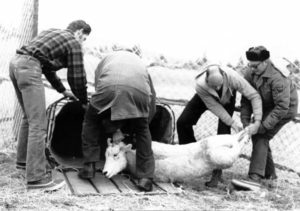 Putting a bighorn sheep in a crate on Wildhorse Island for transplanting. c. 1975. After reviewing videotaped interviews and materials collected, the ad hoc committee realized the value of what had been initiated and decided that a historical video documentary be produced before a book. I was contacted to help with this project because of my background as a Montana Fish, Wildlife and Parks wildlife research biologist and experience with video productions. More videotaped interviews were conducted and included long-time citizen wildlife enthusiasts. Finally in December 2005, a two-part (one hour each) historical documentary entitled “Back from the Brink – Montana’s Wildlife Legacy” was completed. Since then, Montana PBS has aired it several times and numerous public showings occurred throughout the state. The DVD is sold in bookstores, gift shops and sporting goods stores and can be purchased online through the Montana Fish, Wildlife and Parks Foundation at www.backfromthebrinkmt.org or Montana PBS at www.montanapbs.org/Shop/AllPrograms/. Educators in Montana’s Schools and Universities are also using it to teach students about Montana’s Wildlife Legacy. While developing the script and conducting more videotaped interviews for the video documentary, a wealth of additional historical photos, old home movies, documents and personal field notes became available. Only a small portion of this “mother lode” of wildlife memorabilia could be used in the video. This gave motivation to complete the initial goal of the project and write a book. Dr. Picton and I were again recruited to help continue this phase of the project. Information gathered during production of the video laid the foundation for the book, but thousands of additional hours were spent researching background material along with acquiring or developing more illustrations, photos and maps. 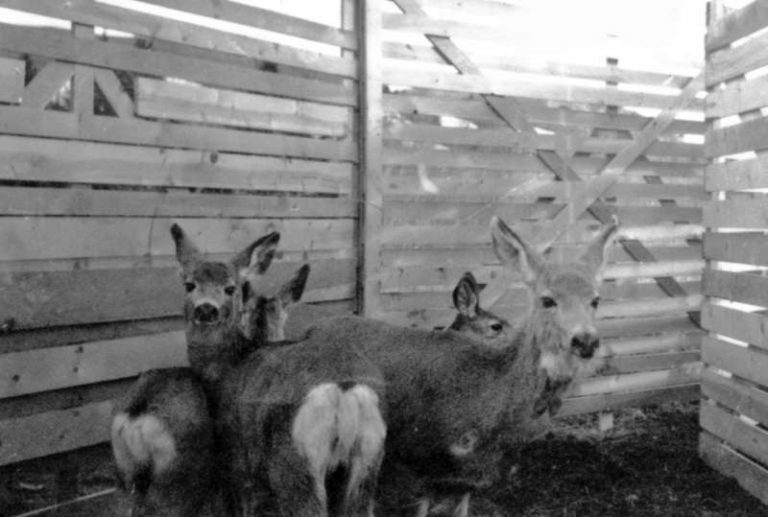 All the effort put forth and materials gathered have made the book detailed and information rich, including the only complete compilation of Montana’s wildlife trapping and transplanting records specific to capture and release sites and number of animals. These records in the form of tables and augmented with maps, illustrations and many historical photos would have been lost if not collected during this overall project. Critical support from state wildlife administrators Jim Williams, Glenn Erickson and Don Childress; Spence Hegstad of the Montana Fish, Wildlife and Parks Foundation; Tim Crawford – Pheasant Farms LLC and Media Works were instrumental in the completion of this project. Other contributors are credited in the acknowledgements of the book and in the video documentary. The book contains over 600 photos, illustrations, tables and maps. Many of the photos are historic and have seldom been seen. This book along with the video documentary will be valuable to educators, junior high, high school and university students, historians and anybody else interested in Montana’s wildlife and its history. We hope it will serve as “The Written Reference” for Montana’s Wildlife Legacy for years to come.